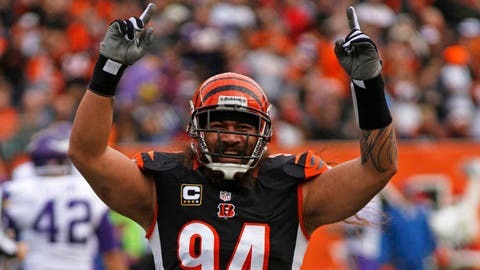 Bengals defensive tackle Domata Peko pumps up the crowd at Paul Brown Stadium in Sunday's win over the Vikings. CINCINNATI — A couple of weeks ago after the Bengals had beaten the Indianapolis Colts, there was a stirring thrill running through the team’s post-game locker room. It was a big win, a win against a fellow division leader, a team that was going to be in the playoffs and it looked like a couple of other scenarios were going to fall in their favor. Those scenarios didn’t work out. Cleveland lost a late 12-point lead at New England and Baltimore rallied for a last-second victory against Minnesota. The Bengals got another win Sunday, a 42-14 blowout of Minnesota, and this time the scenarios fell their way. When Miami lost at Buffalo, 19-0, about 10 minutes after the game at Paul Brown Stadium ended, the Bengals clinched their third consecutive playoff appearance. When New England beat Baltimore, 41-7, some 3Â½ hours later, the Bengals had their first AFC North division championship since 2009 secured. The Bengals will host a playoff game this postseason; that much is known. Who they will play, when they will play and whether or not that first game comes after a first-round bye is still to be determined but the fact is that game will be at PBS. That’s nothing to sniff at but all season the Bengals have had bigger plans in their mind since losing at Houston in the wild card round last January. "Obviously we have bigger goals but this has been a long road, a long journey," said center Kyle Cook, now in his sixth season with the franchise. "When we first got here there wasn’t that consistency as far the playoffs. We had some good years but there wasn’t that consistency. We were the other team that was playing for your job at the end of the season. Coach (Marvin) Lewis has done a great job with reiterating what we’re here for and if we play as a team what we can achieve. "Look what happened today. Look what’s happened the last three years. When we play together we can achieve greatness. That’s what we’re striving for." Final playoff positioning will figure itself out next Sunday. The Bengals host the Ravens — who are still in a battle for the No. 6 seed with Miami, San Diego and Pittsburgh — and they still harbor thoughts of getting the AFC’s No. 2 seed and the bye that comes along with it. A loss next week and they could slip out of the No. 3 spot and into the No. 4 seed. Slipping up is not what the Bengals have been doing much of this season. Yes, last week in Pittsburgh was a debacle, primarily in the first quarter, but just as they have done all season the Bengals bounced back. After Minnesota got a 36-yard touchdown pass to tie the game five minutes into things Sunday, the Bengals answered by rolling off 35 straight points. Andy Dalton threw four touchdown passes and linebacker Vinny Rey picked off his second pass of the season, returning it 25 yards for his first career touchdown. Rey had helped set up the Bengals’ first touchdown of the game when he sacked Minnesota quarterback Matt Cassel and forced a fumble that defensive end Carlos Dunlap picked up and returned 42 yards to the Vikings 4-yard line. BenJarvus Green-Ellis scored two plays later. When the Bengals spoke after the game, they had no idea that Baltimore was going to get steamrolled at home. A Ravens win would’ve put the Bengals in line for that No. 2 seed; now they have to win next week and hope that Buffalo can win at New England to get that bye week. Or they just show up and play when they’re told. "We’ve got a lot of work to do. It’s not over," said defensive end Wallace Gilberry. "We’ve got to beat Baltimore next week and wherever the chips fall we’ve got to go out and play ball. We don’t know what’s in store, what’s ahead of us but we know that we have to stay the course like we’re doing. We’re excited about the win but we’ve got to put it behind us and move on to the next one." In the next couple of weeks that stats and facts will flow. The Bengals are 0-4 in the postseason under Lewis. The franchise hasn’t won a playoff game since the 1990 season and hasn’t scored more than 17 points in its last five playoff games. Dalton hasn’t exactly lit up the field in his two previous appearances, both at Houston. Those are undeniable truths. So is this: the Bengals will be one of 12 teams playing for a shot at the Super Bowl. "To be in the playoffs every year since I’ve been here is huge," said Dalton. "It gives you a chance to accomplish your ultimate goal. It’s big that we’re going to be back there this year. It’s a huge goal for us, so it’s great to accomplish that. We’ve got to keep going; there’s a lot in front of us."